Alabama football coach Nick Saban's daughter is being sued by her ex-best friend. A night of partying by college students ended in hurt feelings and ultimately a brawl between two sorority sisters back in 2010. Four years later a judge is considering whether the case that one of the two former best friends brought against the other should go in front of a jury. Why is this making national news? Most likely because the woman being sued is Kristen Saban, daughter of Alabama football Coach Nick Saban. Oh, and possibly because plaintiff Sarah Grimes’ attorney, Stephen Strickland, offered up a great quote in court Tuesday, telling Tuscaloosa County Circuit Judge James H. Roberts Jr. that jurors should hear the case because the defendant punched his client "like Boom Boom Mancini." "She had the devil beat out of her," Strickland added of Grimes, who, like Saban, was a member of Phi Mu sorority at Alabama and has since graduated. Saban’s lawyers asked for the case to be dismissed. At the end of the hearing, Roberts said he would consider the request. 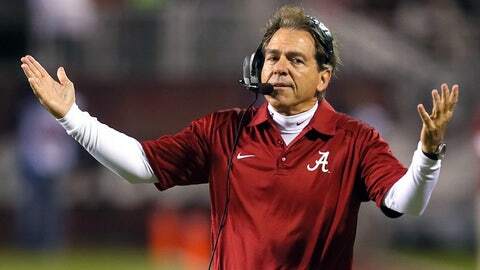 Grimes filed suit against Saban in 2012 seeking an unspecified amount of money for the fight. According to sworn testimony by both women, they were in Saban’s apartment with other friends after several hours of drinking on the night of the alleged incident. A disagreement is said to have started when Grimes told Saban to stop being "pathetic" about her boyfriend and Saban responded by making a negative comment about Grimes on Facebook. Then the altercation allegedly became physical. Grimes says she received a concussion and also required nasal surgery. Saban claims her former friend grabbed her by the neck but otherwise the fight was just "a lot of slapping and punching, not many landing, and scratching." Court documents also show that prior to the night in question, Grimes had been upset with Saban because Grimes did not receive an invite to a workout in the Crimson Tide football facility or to the premiere of a movie about the Alabama coach.